This beauty has been around since mid-February and has made one of the region’s major climbing crags its home. 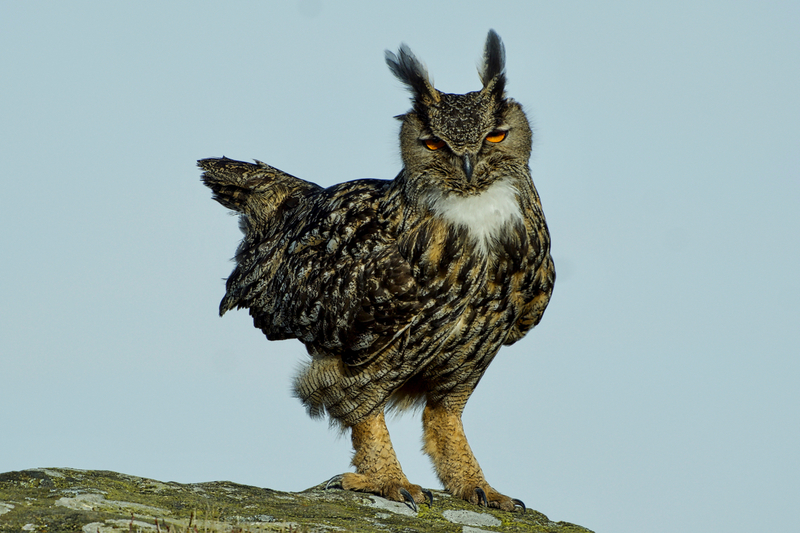 It is a Eurasian Eagle Owl and is normally resident in Scandinavia and Southern Europe although it is estimated that between 12 and 40 pairs nest in the UK. It feeds on small mammals and birds such as crows and pigeons. No doubt it will take the odd grouse or two as well although by feeding on crows, a major grouse egg predator, it could be actually be helping the grouse population, although I fear that the shooting estates will not tolerate its presence. For this reason, I am not going to include the little map giving the precise location although it is fairly common knowledge. The bird is very defensive and proceeded to give me a very close-up view of its 6-foot wingspan but unfortunately (as far as the photography is concerned), my reactions were too slow. Wise old owl, maybe it did a full reconnaissance and didn’t fancy encampment on crags a few miles to the east. Ah, that probably explains the 2 head torches I observed descending a certain well known hill to a certain well known car park at around 22:30 last night. ……. much pheasant rearing in the immediate area, can’t see this ending well. Do you know if the bird is still around? Haven’t heard of any sightings since last spring. I usually get that way every ten days or so. Still up there. If you know where to look.